The Layout, Avatar & Tools for the T&TTT Forum. and some tools to help you communicate with us. listen to it in the background while surfing this fact full website. Much information is up here. information from the low fruit ... pick here. I will note a few links but your charge is to search here first. has pictures of the best trailer builds. Search Link to search the forum for data. Member list Link Find members and who has posted the most. The Store Link Find many items with the T&TTT logo for sale (The Store). Design Library Link Trailer designs aplenty and Learn Types of Trailers here. Generic Benroy Plans(rev*) Link Design trailer by founder Mike Schneider. Profile Link Set your preferences & Avatar (Picture of your face recommended) here. You have X # Messages Link Will show private messages sent to you. Please remember to Check your messages when you log on and before you log off. Vintage Plans (rev*) Link 1930-50' vintage plans Learn more types of trailers here. Donate Link An easy link to help keep the forum running You may donate. T&TTT Map Put your location in the USA here and Chat available. Album Link Public & Private Albums (Look mid page and Click "Your personal Gallery" & to manage your pictures). Calendar Link Birthdays & Gatherings and Events. Help with photos Link Procedures to put 640x480 or less size photo in your gallery to a post. 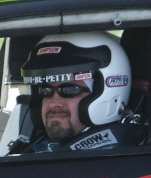 Rich's List (rev*) Link Starting point to find parts for your trailer build. links to the right hand side that are very useful. View unanswered posts = See unanswered posts so you may help with questions. 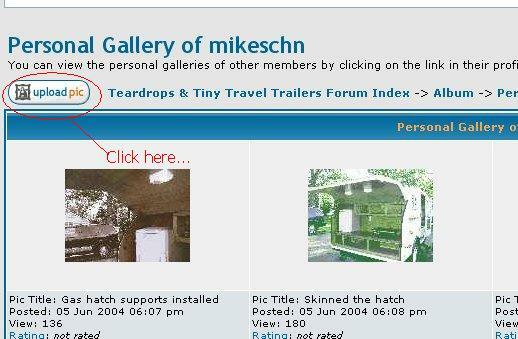 Note: At the BOTTOM of the "Teardrops & Tiny Travel Trailers Forum Index"
You will find the BOX "Who is Online". when they are on line. Setup an AVATAR for your profile to let us see you. When you are logged in, just go to the top of the header at top of the page and click on “Profile”. This should bring up your profile info. Scroll down to the 'Avatar control panel'. and the file size no more than 98 KB. it conforms to the dimensions and size requirements, listed above. file on your computer and click “Submit” at the bottom of the page. copied to this site, and click “Submit” at the bottom of the page. to link to, and click “Submit” at the bottom of the page. the next few paragraphs and go on your way. Happy computing. Then skip this first explanation and go below and read on please. Need help go below to this heading>"Three basic picture manipulation steps explained:"
Now pictures can be smaller in size but the system will stop you from larger. the forum, who may need help. I have a Kodak EasyShare C300 and my lowest definition is 1024 x 768. Does that mean I can or can't upload to this site? You can uPload your pictures after you reduce them in size. reductions using 2 clicks of your mouse most of the time. Read on if you want more help. 2) UPloading Pictures to your personal album on this forum. 4) Recap UPloading and Embedding Pictures. software called Pixresizer to re-size your pics. There are many resizing programs out there. I chose this one. using 2 clicks of your mouse most of the time. sending them in emails or add them to your album here on the forum. After you download the program to your computer and installed it. Please come back here and look at the brief tutorial below for quick use of the program. 1) One picture at a time. 2) Doing a whole folder of pictures at the same time. of your camera that you have saved to one folder. 1) Make sure the top selection "Work with one file" is selected (default). custom window and see that is below 800 wide x 652 height. Note: I chose (600x450) adjust to a size below the max size = (800 wide x 652 height) if you wish. Note:In one click it is done. This example being the before and after. well within the 800 wide x 652 height Max size for a picture to uPload. 1) Click the top selection "Work with multiple files". you keep most of your pictures in the 600x450 range you will be satisfied. 2) Click "Source" = (Chose where the folder is located in your computer). That is it ... you have now re-sized many pictures in one foul swoop. that you re-sized all the pictures to. 2) UPload your pictures to fit in your album on the forum. 2) Scroll down mid page to see the words "Your Personal Gallery"
3) Click "Your Personal Gallery"
NOTE: If you have done something wrong the error message will tell you. If all is well you will see your uPloaded Pic in your album. 1) Go to "Your Personal Album"
2) Click Picture you want to use in your post. 3) View The picture and copy the URL location. then copy the "Properties Link" and use that in step 4. 5) Highlight The URL and hit the Img button. That's it, you're done! uPloading it or copying it to the forum. to that location using the [img]URL%20of%20pic%20location[/img]. 2)Then right click on the picture of the diagram. won't show the picture correctly. This picture is posted correctly. and not have to uP load it to your T&TTT forum library. Find Threads and search for information on this forum. How to search using google to find more of what you want with ease. In the google window use this format or on the URL window of IE type the following. to what you want here on the forum. Put URL behind TEXT so you click the TEXT and go to the URL. 2) Highlight the URL and click URL @ the top of the Post reply text box. Here is a link to the forum that has posts about this subject. Run your mouse pointer over these words and click. Learn how to make TinyURL work for you. Used to make hellacious long URL's to short URL's. Go here > http://tinyurl.com/#toolbar Drag the TinyURL to your Bookmarks toolbar. and copy the new link and paste it in the forum via the Post a reply box. I will point you to the links here and explain some of the benefits. too long. I would equate the one screen view of the web as from a prison cell. the same time. So you can try Firefox and see if you like it. Is Mozilla Firefox browser for you? Consider using Mozilla Firefox as a safer browser with many Extensions. Here is the link for decision information & installation instructions for Firefox (FF). Firefox 2.0.0.7 has a spell checker built in. to help you find threads and Items on this forum. 1) The first and a must is the Basic Google Toolbar with spell checking. Spell checking posts in your browser can be easy with the basic Google Toolbar. In the google window use this format. can help to make your generic Firefox experience more pleasurable. First as my eyes need some contrast to see better I chose the Noia 2.0 Extreme Theme. By no means is this your only choice but for me this theme sure works. The Extensions a person can choose are like the stars in the sky. You choose your level of participation and creative browsing. Here are a few Extension choices that I chose after installing Firefox that you might consider. little nuggets of pleasure to make your online experience better. very much maybe you could share them with me? Last edited by sdtripper2 on Mon Oct 01, 2007 2:45 pm, edited 35 times in total. Now I have no excuse not to learn tiny URLs. Seriously--great job. I myself am way too lazy and my life is way too glamorous to take the time to research all of this. For example, right now, I have to remove the coal scum from my barbecue. Steve, this is so great! I'm not a newbie, but man, this is super! Steve, once again you set new standards for research and information. this welcome message, we want you to know we are glad you are here. are an attempt to have a helping first hand at sharing information. as well as long time members of this forum. May we suggest you read any of the following threads of interest to you as a starting point? Thinking of Building a trailer? Want to buy a Teardrop trailer? Thinking of buying a Teardrop trailer or seeing more pictures? Want to see movies of Teardrop trailers? them (At the top of each forum heading) from time to time if you please. experiences with all and the forum learns on many subjects. Rule # 1 From the founder of the forum "Mike Schneider" No Fighting ! we just love the pic's. We got to have um and that is rule #2.
to life and well your problems will melt away. Ready to build, already own a trailer or just looking, we like everyone. is active so come have fun with us. With warm regards, "We are so glad you found us." Last edited by sdtripper2 on Mon Sep 24, 2007 1:31 am, edited 1 time in total. Welcome Newbies. Please post in a separate thread so we can all say hi to you.